Dezeen promotion: free registration is open for Clerkenwell Design Week 2013, taking place from 21 to 23 May in London. As part of the three-day event, a series of installations and exhibitions by local architects and designers will be presented around the central London district. A giant target made of stainless steel and brass panels by Giles Miller Studio will be installed at St John's Gate. Zaha Hadid Design will open its gallery of furniture, design and architectural models to the public for the first time. Car brand Jaguar is collaborating with the Royal College of Art to create an installation for the Farmiloe Building, where Jaguar will also show its new F-Type vehicle. Other highlights will include a mobile food hall presented by restaurant chain Canteen and Transport for London, plus a village of huts designed by not-for-profit organisation Architecture for Humanity. For more information and to register free for the event visit the Clerkenwell Design Week website, and read about more exhibitors in our previous story. Alongside the innovations shown by the festival's many exhibitors and showrooms, Clerkenwell Design Week (CDW) is proud to present a series of curated installations and exhibitions under the banner Clerkenwell Presents. Challenging and inspiring the design community and visitors alike, these attractions have become an integral part of the three-day event, together with the Fringe events hosted by the numerous architectural, design and creative practices that make Clerkenwell the most important creative district in the UK. For the first time since its inception, local resident Zaha Hadid Design will open the doors of their design gallery to the public for the duration of the festival. The gallery features a collection of Zaha Hadid’s furniture and design pieces on the ground floor, and a never-before-seen archive of architectural models spanning over two decades of the architect’s stellar projects on the first floor. 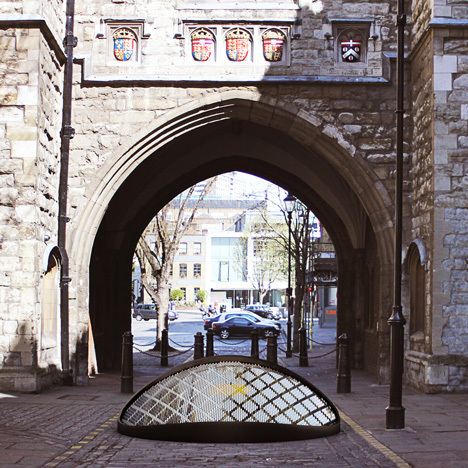 Giles Miller Studio will create an installation at St Johns Gate, inspired by the unique concentration of Clerkenwell’s creative community. The installation will take the form of a giant target, representing Clerkenwell as the architectural and design nucleus of London, formed of stainless steel and brass ‘pixels’, laid at opposing angles to reflect light in various degrees and depict subtle and intriguing patterns. A signature device of the studio, the elongated shape of these ‘pixels’ has been especially designed for this installation. ￼The Ten Tables installation in Charter House Square is a cross-fertilisation of ideas, materials and techniques resulting from a collaboration between Lubna Chowdhary and Domus Tiles. A series of ten tables, each uniquely tiled by Chowdhary, will be used as a meeting place for visitors, to congregate, dine and share ideas. The tile surfaces will be applied to Enzo Mari's Autoprogettazione table. The designer’s 1974 manual re-emphasised the empowerment of craft and making, offering nineteen furniture designs using readymade cuts of timber and usually requiring nothing more than a hammer and nails. Inspired by the medical history of the Priory of the Order of St. John, Birmingham- based furniture designers Plant & Moss began the chain, passing their finished piece to British designer Dominic Wilcox. Dominic’s design was then interpreted by Georg Oehler, one of the three designers behind Pudelskern, into a completely new product. The final work is an interpretation by artist Matthew Plummer Fernandez, adapting Oehler’s design to exploring emerging digital cultures. During the festival, a landscape of 200 chairs will appear en masse in the garden of St James’ church. The chairs will be designed, built and arranged by London-based design and architecture collective Assemble. At times appearing absurd and otherworldy, the multitude of chairs in each arrangement is intended to challenge visitors and create new crowd behaviours. Throughout the festival, the arrangements will be continually changing, facilitating different events and uses throughout each day. The chairs will be manufactured in Assemble's workshop at Sugarhouse Studios as a prototype low-cost DIY chair and instructional manuals for their fabrication will be given away for free. London-based architectural practice Mobile Studio will revisit and reinterpret the concept of the classical garden maze, playing on light and refraction to present Mirare Maze Folly. With walls made entirely of clear acrylic, the structure will sit as a ghost-like folly within the festival, allowing the setting of St John’s Square to permeate through the maze. Not-for-profit organisation Architecture for Humanity is specially designing and building a village of huts for CDW - each with a different theme reflecting the ethos of the global charity. A Green Hut will be clad with edible plants, a Water Hut will feature an arrangement of pipes and bottles, a Textile Hut will explore soft materials and finally a Remakery Hut will showcase objects from the Brixton Remakery centre. The collaboration follows last year’s successful "Love Architecture" campaign, which saw the "Love Hut" presented in St John's Lane. Founded in 1999 by British architect Cameron Sinclair, Architecture for Humanity is a global charity which promotes a more sustainable future through the power of professional design. Taking place during CDW at the SCIN Gallery, The Making Designers exhibition will explore the schoolwork of well-known designers, including Nigel Coates, Michael Marriott, Linda Morey-Smith, Matthew Hilton, Tom Lloyd, Simon Pengelly, Ab Rogers, Gala Wright, Anna Hart, Mark Gabbertas and Terence Woodgate, with more still to be announced. The exhibition is the initiative of John Miller, founder of MARK, in reaction to proposed reforms in educational policy from education secretary, Michael Gove. Despite a welcome u-turn on the EBacc scheme, which would have all but eliminated design from the UK curriculum, education still faces a steady decline in making and creativity. By exhibiting the earliest work of design industry leaders, Miller and onoffice hope the Making Designers exhibition will boost the importance of “making” and inspire the next generation of designers. The headline sponsor of CDW, UK-based manufacturer of performance and luxury vehicles, Jaguar, will also bring an innovative and engaging design installation to the festival, in partnership with the RCA. Students from both automobile and textiles design courses have been tasked to create their vision of a future design language for Jaguar. The winning creation will be showcased within the Farmiloe Building during CDW, providing a unique reflection on the design process for the car giant. Jaguar's relationship with the RCA is long established, with Jaguar's leading designers Ian Callum and Julian Thomson both being RCA alumni of the Masters in Vehicle Design. Jaguar will also show the new F-TYPE at the Farmiloe. Transport for London (TfL) and restaurant chain Canteen present the next instalment in their ongoing collaboration, with the London Transport Mobile Canteen. Unveiled at Clerkenwell Design Week, the canteen will take up residence at the Farmiloe Building in the main courtyard. The mobile Canteen has been designed by Very Good and Proper, a design practice founded especially to make products for London's Canteen restaurants. From the turn of the century to the 1970s, the London Transport Canteens provided food and beverages to the capital’s transport workers, with over 180 canteens - both static and mobile - feeding over 100,000 employees. The London Transport Pop-Up Canteen is a contemporary celebration of TfL’s canteen history. along with a range of outdoor furniture inspired by TfL's design heritage. The mobile unit will be serving a selection of classic British food and beverages from Canteen's menu.